Seymour 620-1431 MRO Light Gray Primer spray paint for general, commercial and industrial use. MRO Industrial Enamels are a superior, lead-free industrial coating formulated for maintenance operations where maximum performance is required. 3-4 times the coverage of standard aerosol spray paint. 20 oz. can. The most advanced high solids, VOC Compliant coating in the industry, 3-4 times the coverage of standard aerosol spray paint. A superior, lead-free industrial coating formulated for maintenance operations where maximum performance is required. Protects against rust, weather, oil, gasoline and most corrosive chemicals. 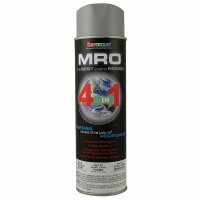 MRO High Solids resists abrasion and heat, withstands high humidity, has single coat hiding and is USDA authorized. Heat resistant up to 300-Degree F. As a responsible corporate citizen, Seymour of Sycamore is thoroughly committed to protecting the natural environment and ensuring the well-being of our employees. This means not only providing a safe, clean and healthy workplace, but also fulfilling our legal and social responsibilities within the community. Seymour has developed coatings with waterborne and high-solids resins as an alternative to traditional solvent-based polymers. Seymour products do not contain lead, cadmium, mercury, chromates or chlorinated solvents. 1. Thoroughly clean and dry the surface to be painted. Several light coats provide a better finish than one heavy coat. 2. Paint in a clean dry area, free of flying dust or debris. 3. Do not paint in a strong breeze. 4. Vigorously shake the can of aerosol paint until a the rattle is heard and for one minute after that. 5. Hold the can eight to twelve inches away from your work surface. 6. Depress the spray nozzle before hitting the work surface to ensure a smooth paint flow onto your target and stop immediately after passing beyond your target. 7. Pause frequently to shake can. This ensures the contents stay mixed. 8. Where possible, spray both vertically and horizontally to get complete coverage. 9. As you spray, be prepared to change cans as soon as your nearly empty can begins to sputter. 10. Several light coats provide a better finish than one heavy coat. 11. Finally, let your finished product stand until completely dry. Remember, drying times will vary depending on the humidity level and paint thickness.